An exhibition of iron sculptures made by Dylan, who has sold more than 58 million albums around the world in a career that started in the folk scene of the early 1960s, will open later this year. The America n singer-songwriter, famed for tracks including Blowin' In The Wind and Mr Tambourine Man, has made seven iron gates out of bits of scrap and old tools. He said: " I've been around iron all my life ever since I was a kid. I was born and raised in iron ore country - where you could breathe it and smell it every day. And I've always worked with it in one form or another. "Gates appeal to me because of the negative space they allow. They can be closed but at the same time they allow the seasons and breezes to enter and flow. They can shut you out or shut you in. And in some ways there is no difference." The show, called Mood Swings, opens at the Halycon Gallery in New Bond Street, London, in November and will also include paintings and signed limited-edition works for sale. The gallery's president Paul Green said: "The forthcoming exhibition will be the most comprehensive and authoritative collection of Bob Dylan's art to date. "While Dylan has been a committed visual artist for more than four decades, this exhibition will cast new light on one of the world's most important and influential cultural figures of our time. "His iron works demonstrate his boundless creativity and talent. As these artworks are made at home, not on the road, they give us a rare glimpse into another part of the artist's own personal universe." 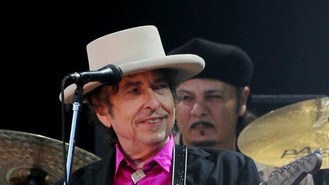 Dylan's career has seen him move away from his folk roots and embrace rock music - a move that caused controversy when a member of the audience at a g ig at Manchester Free Trade Hall in 1966 branded him ''Judas'' for betraying acoustic music.